Nvidia’s groundbreaking G-Sync HDR monitors aim for the sun, but unlike Icarus, these dazzlingly bright displays never fall back to earth. 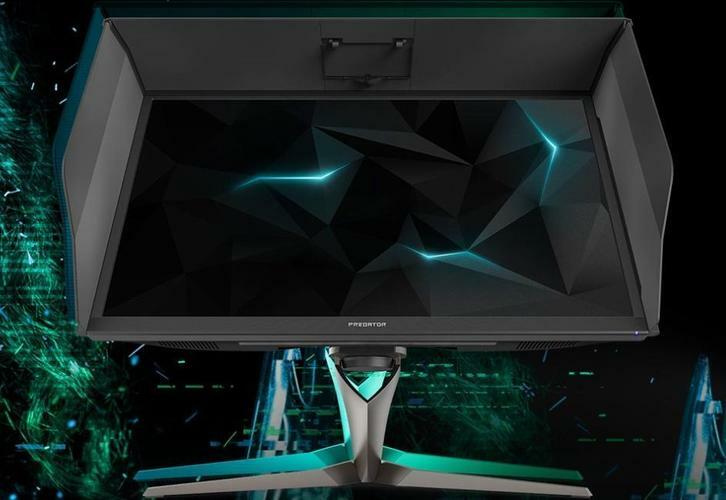 On paper, the Acer Predator X27 ($2,000 on NeweggRemove non-product link) and its G-Sync HDR cousin, the Asus ROG Swift PG27UQ (also $2,000 on NeweggRemove non-product link) are the Holy Grail of PC monitors. These are among the first monitors to support 4K resolution at refresh rates higher (significantly higher) than 60Hz, and two of only three monitors certified to achieve DisplayHDR 1000 certification. They’re the first displays ever to support both 4K/120Hz and DisplayHDR 1000, with Nvidia’s gameplay-smoothing G-Sync technology as the cherry on top. They have quantum dots. No other monitors push as hard or tick as many checkboxes as the first round of G-Sync HDR displays, full stop—which may explain why they suffered from a year-long delay before finally hitting the streets this summer. Good news! The Acer Predator X27 was well worth the wait. This is easily—easily—the most stunning display I’ve ever laid eyes on. It’s vibrant, fast, and utterly gorgeous. It’s like staring into the future…complete with a few bleeding-edge quirks. Is a monitor that costs more than most people’s entire gaming rigs worthwhile? Let’s dig into the Acer Predator X27. Yep, that checks almost every box you could ask for—almost. Most of my few minor nitpicks with this display lie in elements of its physical design. Might as well get those out of the way before (spoiler alert) heaping lavish praise on the panel itself for the rest of the review. Like other G-Sync-enabled monitors, the port selection is sparse, and the gorgeous panel is surrounded by chunky black bezels. Plastic bezels, not metal like you’d hope for in a $2,000 product. I also wish these G-Sync HDR monitors were a bit larger. 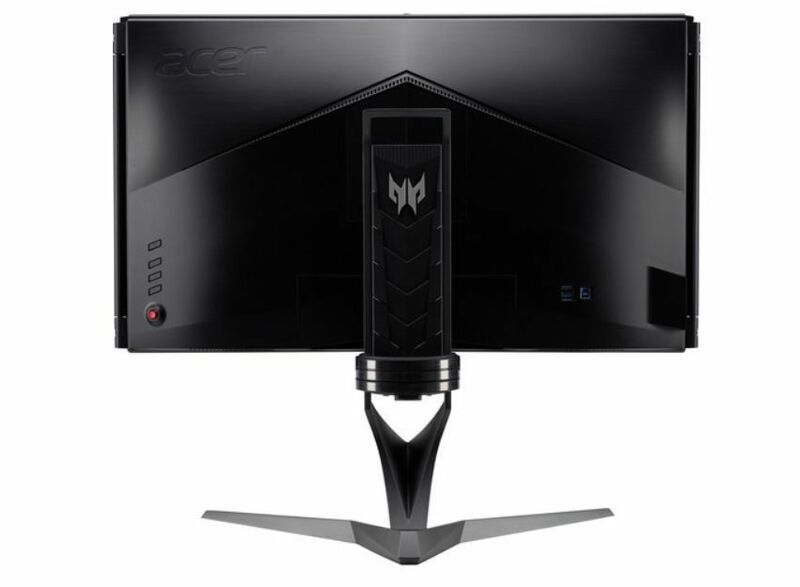 The Acer Predator includes thick plastic bezels and optical monitor shrouds. 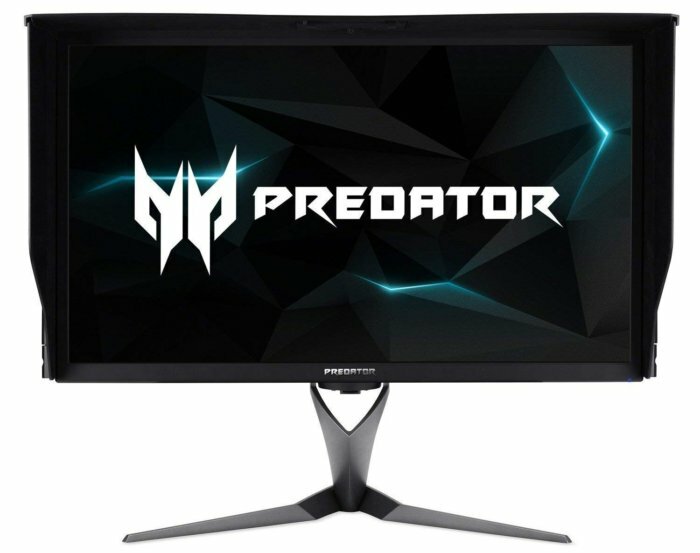 As the name suggests, the Predator X27 packs a 27-inch screen. 4K resolution looks deliciously smooth at that size thanks to the denseness of the pixels, but text and other visual elements appear unusably tiny, necessitating the use of scaling. Fortunately, Windows 10 scales onscreen elements to 150 percent by default. It makes everything legible, but you lose the extra real estate a 4K display offers. I typically prefer 4K monitors to be at least 32 inches to strike a better balance. PC Perspective’s teardown of the Acer’s G-Sync HDR cousin, the Asus ROG Swift PG27UQ, shows that these 4K G-Sync HDR displays rely on a new G-Sync hardware module, complete with a custom Altera FPGA, 3GB of dedicated DDR4-2400 memory, and a fan to keep it cool. Pushing the edge of display technology ain’t easy. But my PC runs virtually silent, with a large closed-loop water cooler and a graphics card whose fans stay still outside of gaming, and it’s jarring to hear a fan spool up in my monitor after about an hour or so of standard desktop use. It’s quiet enough that watching videos or gaming drowns out the fan, and I suspect the case fans and CPU/GPU coolers in standard gaming PCs that aren’t built for low-noise would likely do the same. Nevertheless, the fan noise remains loud enough to be noticeable in my circumstance. That’s it. That’s the list of my gripes about the Predator X27, aside from a couple of minor bugs we’ll discuss later. None are dealbreakers. They’re all extremely minor, and after the initial monitor setup most of the issues fade away, never to be noticed again. (Well, except for the fan.) The solidly constructed Predator X27 sticks to the basics to let the vivid panel steal the show. HDR displays with stark contrast ratios look better in darker environments, and Acer includes optional monitor hoods to shade the panel—a nice touch. Another nice touch: Outside of those panels, the Predator X27 comes fully built, with no assembly required. 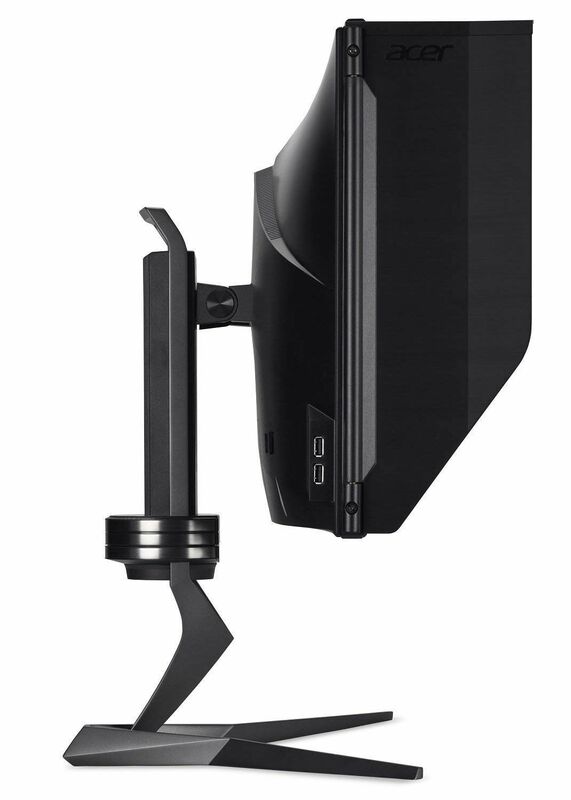 It also includes a VESA bracket if you want to mount the screen on your wall. The monitor comes with DisplayPort and HDMI cables in the box, and you’re going to want to use those rather than the cheapo cables in your cord drawer. Nvidia recommends not only using “a well-shielded, high-quality DisplayPort cable,” but also to connect the monitor “to the GPU DisplayPort furthest from the motherboard” if possible. Sheesh. Using a low-quality cable could prevent you from achieving high refresh rates, or create random blackscreens and flashing backlights. Once you’re up and running, it’s time to decide what refresh rate you want to use. The Predator X27's controls are on the rear. Or if you don’t care about the technical details you can skip this section, plug in the Predator X27, and roll with the defaults. This monitor comes calibrated out of the box and consistently looks great anyway. More on that in the panel performance section. This is a 120Hz monitor that’s overclockable to 144Hz, but the Predator X27 isn’t capable of checking all of its technological boxes at those speeds. You’ll need to set the refresh rate to 98Hz—far slower than the 144Hz Nvidia advertised G-Sync HDR at, but much faster than the previous 4K/60 barrier—in the Nvidia Control Panel to see full 10-bit color with no chroma subsampling. If you keep the refresh at 120Hz, the image drops to 8 bits for standard content, or the monitor switches to the alternative YUV422 output color format at 10-bit depth for HDR content. YUV is a slightly darker, more compressed color standard than sRGB, and this implementation uses 4222 chroma subsampling. That’s a lot of technicalese. Practically, I didn’t notice any difference between 8-bit and 10-bit color in day-to-day desktop use or gaming. After testing all the modes I wound up landing on 98Hz permanently because even the powerful EVGA GeForce GTX 1080 Ti SC2 ($730 on NeweggRemove non-product link) in my machine couldn’t push many games that far anyway. Changing resolution and color format details in the Nvidia control panel. 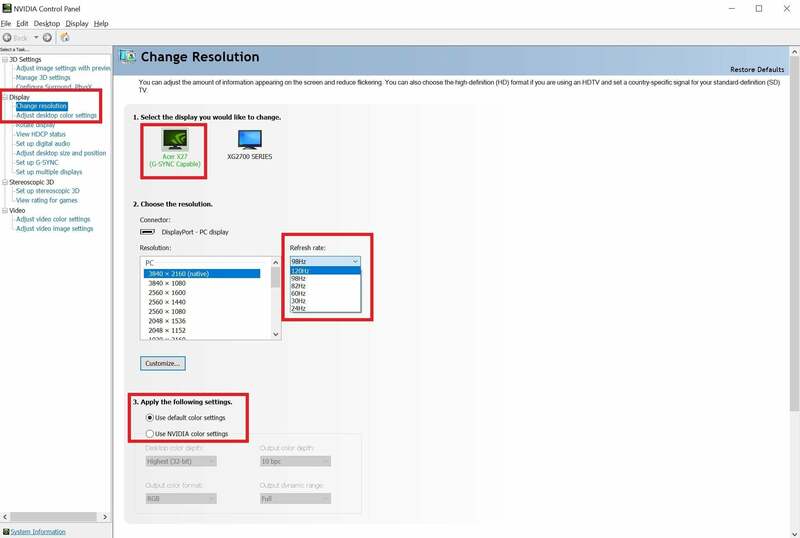 To change the refresh rate of your monitor, right-click your desktop and select Nvidia Control Panel. The software takes a few seconds to open even on speedy systems. Once it does, select Change resolution under the Display heading in the left-hand navigation pane, and choose a refresh rate from the drop-down menu in the main section of the window. If you want to tinker with finer output and color depth details, you can do so in the “Apply the following settings” section, but I recommend sticking to the default unless you have a specific reason to do otherwise. You won’t see a 144Hz refresh rate option here with the default configuration. If you want to fly that high, you’ll need to overclock the monitor. The Predator X27’s controls are located on the rear of the panel, behind the right-hand side of the screen. Underneath a power button, you’ll find three other contextual buttons, as well as a navigation stick. Push on the stick twice to bring up the display’s options menu, then navigate down to the Gaming tab. Click the stick again to enter the submenu. Activate the overclocking option, ensure that the Max Refresh option is set to 144 (the default), then select Apply and reboot. 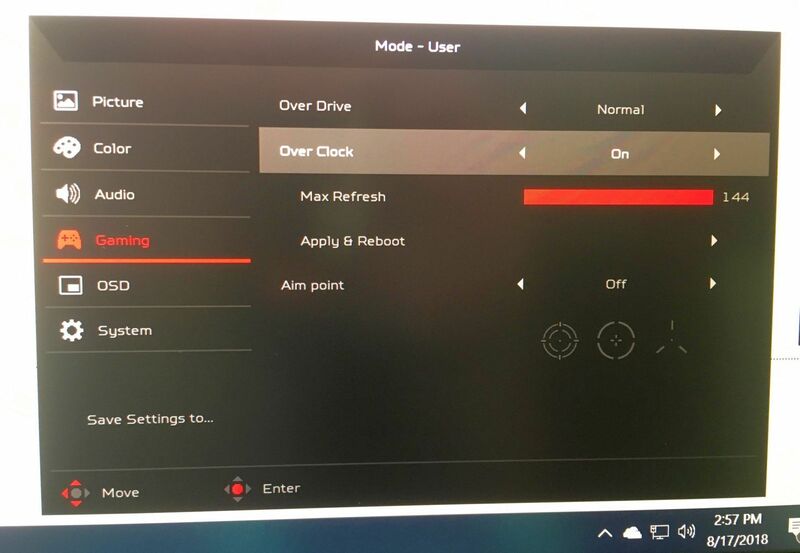 The Acer Predator X27's overclocking options. 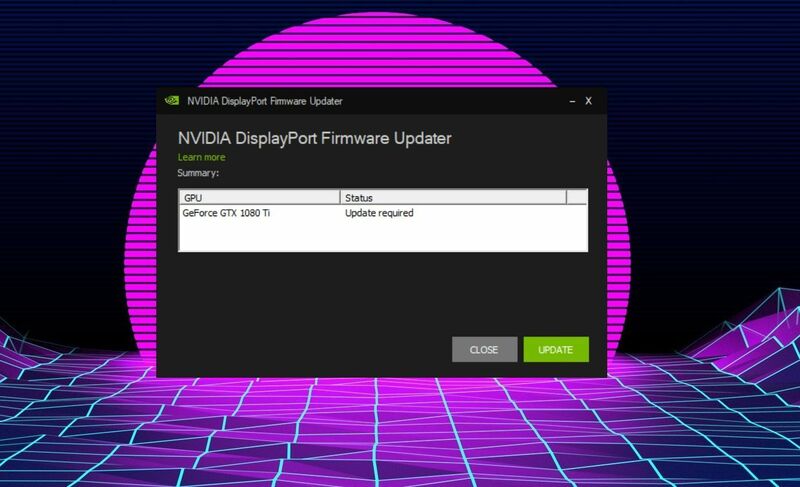 Once the monitor power-cycles, you’ll be able to set the refresh rate to 144Hz in the Nvidia Control Panel. Be aware that doing so requires you to use the YUV422 output color format with chroma subsampling rather than sRGB regardless of whether you’re viewing SDR or HDR content. Fine text can look blurry in some situations.